Objective: Mesenchymal stem cells (MSCs) have generated a great deal of excitement and promise as a potential source of cells for cell-based therapeutic strategies. These data provide the clue of using MSCs in the current work in correcting cisplatin-induced nephrotoxicity, the severest adverse effect of the well-known anticancer drug; cisplatin. Methods: MSCs of bone marrow origin of femora and tibiae of adult albino rats were separated, grown, propagated in culture then identified by both morphology and CD29 surface marker detection. MSCs were injected into the rats” tail veins one day after a single dose (5 mg/kg body weight) of intraperitoneal injection of cisplatin. 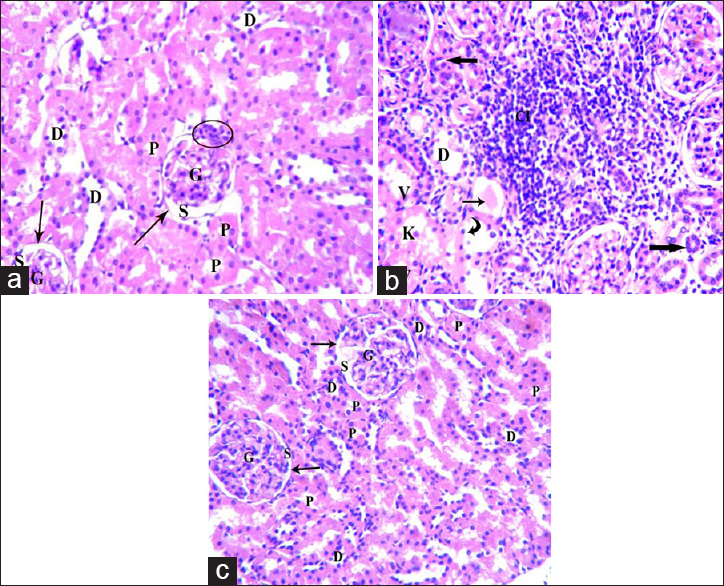 Four weeks later kidney tissue was examined histopathologically and ultra-structurally. Renal functions s(urea, creatinine) as well as serum electrolytes levels (Na, K) were estimated Results: Cisplatin group demonstrated atrophied glomeruli, thickened glomerular basement membrane, dilated urinary space, loss of proximal convoluted tubules brush borders, loss of podocyte pedicels and collagen deposition. Tubular cells showed vacuolization and nuclear membrane degeneration. Serum levels of urea, creatinine, Na and K were significantly elevated. MSCs ameliorated cisplatin-induced nephrotoxicity to a great extent as evidenced histologically, ultra-structurally and biochemically. Conclusion: MSCs have a potential therapeutic effect against cisplatin induced nephrotoxicity. Aim: This cross-sectional study was performed to investigate the hand anthropometric measurements and grip strength of children in three age groups. Methods: 546 children participated in the study and grouped as little (9-11years), youth (12-14years), junior (15-18years). A digital compass with a resolution of 0.01 mm was used for hand anthropometric measurements and a digital hand dynamometer was used for grip strength measurement. Hand dimensions and hand grip strength of both hands were measured. Eight parameters were evaluated for each hand. Results: Hand width values measured from little females and little males and youth males were not statistically significant in sporting and non-sporting groups. There was a statistically significant difference for both hand length of little males and junior males between sporting and non-sporting groups. When shape index values of right and left hands were compared for both groups there was a statistically significant difference for little males and females whereas there was a statistically significant difference in youth females and junior females values compared for sports playing condition. When palmar length/width ratio values were evaluated there was a statistically significant difference between sporting and non-sporting groups in little males for both hands and in junior males for right hand. When grip strength values were evaluated there was a statistically significant difference between sporting and non-sporting groups in little males for both hands and in junior males for right hand. Conclusion: These findings stress the morphological and functional differences of hand according to age, gender and sports playing condition. 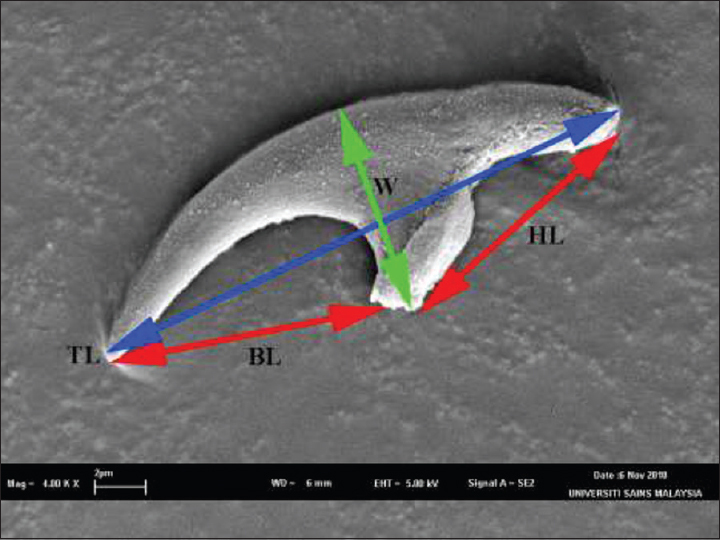 Introduction: Protoscolex and hook morphology had been used to identify different strains of Echinococcus granulosus. Method: In the present study, hydatid sand was isolated from infected organs such as liver, lung and spleen from slaughtered animals in several abattoirs in the selected study areas in Libya. Scanning Electron Microscope (SEM) was used to describe the outer surface of the Protoscoleces and the hooks. Result: SEM pictures showed different morphological characters of the outer surface of the different parts of the same protoscolex. Also, the buds on the outer surface of brood capsule, and showed some differences between the large and small hooks. These findings appeared the that there was a correlation with significant statistical difference between the measurements of large as well as small hooks from the same organs of each host as well as between different hosts. Conclusion: Finally, it was difficult to determine whether these cases are not real distortions in the morphology of E. granulosus. They possibly could be caused by mutation or related to a special strain of E.granulosus. Thus, the findings of the present study would suggest that there is a need to consider relationships between the different characters of hooks with different strains of E.granulosus. Introduction: Suicide rates are computed on the basis of whole population without taking into consideration the cognitive capacity of children to appreciate death. This study was undertaken to find out the variability in suicide rate if children of various ages are excluded from computation of suicide rate Method: Suicide rates were computed taking the at risk population of India-above 6 yrs, 7 yrs, 8 yrs, and 9 yrs for the period 1991-2013, suicide data from the National Crimes Bureau statistics on Accidental Deaths and Suicides of Ministry of Home Affairs, Govt. of India. The data was analyzed for percentage increase for various ages. 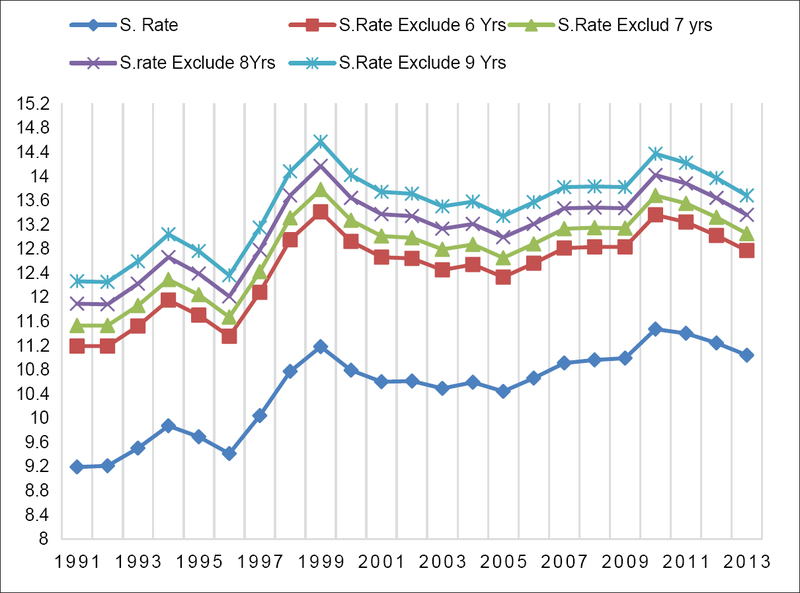 Results: Depending upon the cut-off age the rate increase over a twenty-three year period was from 11.2 to 14.6 and the percent increase was 16.1-33.7. Conclusion: A standardized definition of suicide and a thorough debate on child's concept of death and ability to decide to decide on death across various cultures and regions is needed to understand the enormity of suicide. Introduction: A dietary supplement combination program (PHASE DIETS: ONE WEEK DIET PROGRAM) consisting of liquid supplement and a protein shake was studied to determine its safety and efficacy on weight/fat loss, cholesterol and triglycerides levels in thirty five overweight adults between ages 14-60. Methods: This open label trail measured total body weight, body fat percentage, waist circumference, hips (females), chest (females), abdomen (males), glucose, total cholesterol and triglycerides before and after one week on the dietary program. A group of thirteen subjects continued on the dietary program for one more week and anthropometric measures were obtained. Results: Interestingly after only one week on the dietary supplement program the subjects experience a statistically significant (p < 0.05) weight reducing effect. This weight reduction was accompanied with a corresponding statistically significant (p < 0.05) decrease in body fat percentage. In addition significant decrease in total cholesterol (p < 0.05) and triglycerides (p < 0.01) resulted. Also reduction in waist, hip and chest measurements were obtained. Conclusion: We conclude that the dietary supplement combination program studied herein is a safe and effective way to assist adults in weight, fat, cholesterol and triglyceride reduction. Introduction: Height has been one of the impressive factors for personal identification of individuals since long ago & has always been of immense interest to anthropologists & for medico-legal purposes in Forensic Medicine. 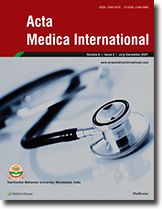 Methods: The present study was conducted on 800 Students (400 male & 400 female) medical students of cosmopolitan origin, ranging from age group of 17 . 25 years of Western U.P. The measurements were taken at fixed time between 2 to 5 p.m. to eliminate the discrepancies due to diurnal variation. Results: Gender differences with respect to the mean cranial length, cranial breadths were found to be significantly larger in males compared to females. Correlation coefficient between the stature and measured cranial dimensions were found to be statistically significant and positive in both males and females. Independent linear regression analyses for predicting the stature using the head length and head breadth in both genders were: Male - Stature = 109.97+3.18 x hl; Stature = 107.64+4.19 x hb Female - Stature = 121.54+2.03 x hl; Stature = 114.88+2.58 x hb. For height & cranial dimensions measurements, all three estimates yielded a very high degree of precision (TEM < 0.5 cm, rTEM < 0.84%, and R ≥ 0.98). These results suggest that both height and cranial dimensions a are sufficiently precise for anthropometric research applications. Conclusion: If one of the parameter is known the other can be known by applying the regression equations and this is of paramount importance to the forensic and anthropology sciences. Introduction: In Bangladesh, many adolescents work in garment sector which is an important contributor to the country's economy. This study aimed to investigate the dietary pattern and haemoglobin level of the adolescent female garment workers in Bangladesh. Methods: This was a cross sectional study conducted in a peri-urban area in Bangladesh in 2008. The food intake pattern was assessed by food frequency questionnaire and level of haemoglobin was estimated by haemoglobin colour scale (HbCS). Anaemia was defined as the haemoglobin level of <12 g/dl. Results: Among 108 participants, 104 (96%) were muslim, 83 (77%) were unmarried and 54 (50%) had a primary level of education. Most of their parents were illiterate. Sixty six (61%) respondents had a large family (>5 family members, mean 5.2, SD±2.1). 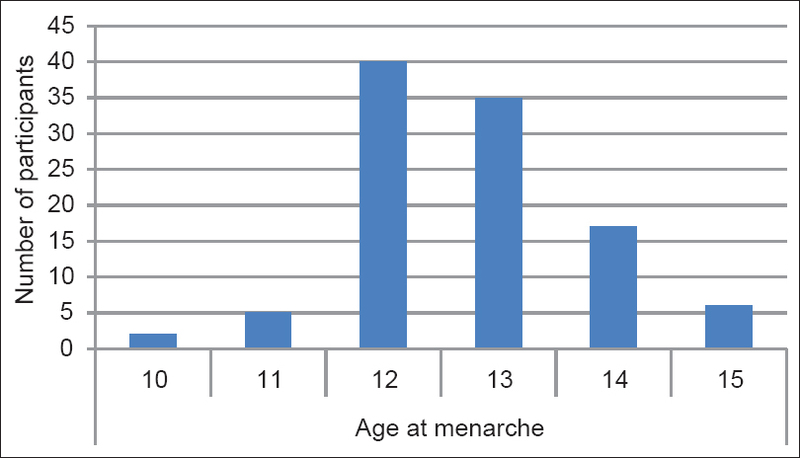 The mean age at menarche was 12.91±1.37 years. Majority of them worked for >12 hours (55, 51%), did not watch television (77, 71%) and had just three meals with no snacks in between the meals (97, 90%) in last seven days. Fish, pulse and fruits/vegetables were consumed for >6 times in a week by 59 (55%), 56 (52%) and 68 (63%) respondents, respectively. Majority of the participants did not consume milk (65, 60%) and meat (62, 57%) in last seven days. Prevalence of anaemia was 92% (99); 54% (58) were moderately anaemic and 38% (41) were mildly anaemic. Discussion: Prevalence of anaemia among adolescent female garment workers is extremely high. They also consume inadequate food. Immediate steps should be taken to improve nutritional status of these girls. Introduction: Stroke data were obtained as SMR01 (157,639 incident stroke hospitalization in Scotland between 1986-2005). Method: To observe variation in weather parameter, with first stroke incidences per day, during winter, daily mean temperature/total rainfall/average daily atmospheric pressure was compared with frequency of incident strokes per day using ANOVA (Analysis of Variance). Result: The analysis reveals an inverse statistically signifi cant relationship for average daily temperature whereas total daily rainfall and average daily atmosphere pressure exhibit borderline significance. Conclusion: Correlations of low temperature with stroke might be due to concurrent infection of respiratory system. Introduction: Type 2 diabetes is the third largest cause of mortality in the United Kingdom, with about 50% of patients' having developed complications at time of diagnosis. We consider that the evidence which explores the actual hazard ratios of mortality has not been consistent. n this paper we discuss methodology and review the most recent accurate data on mortality in type 2 diabetes. 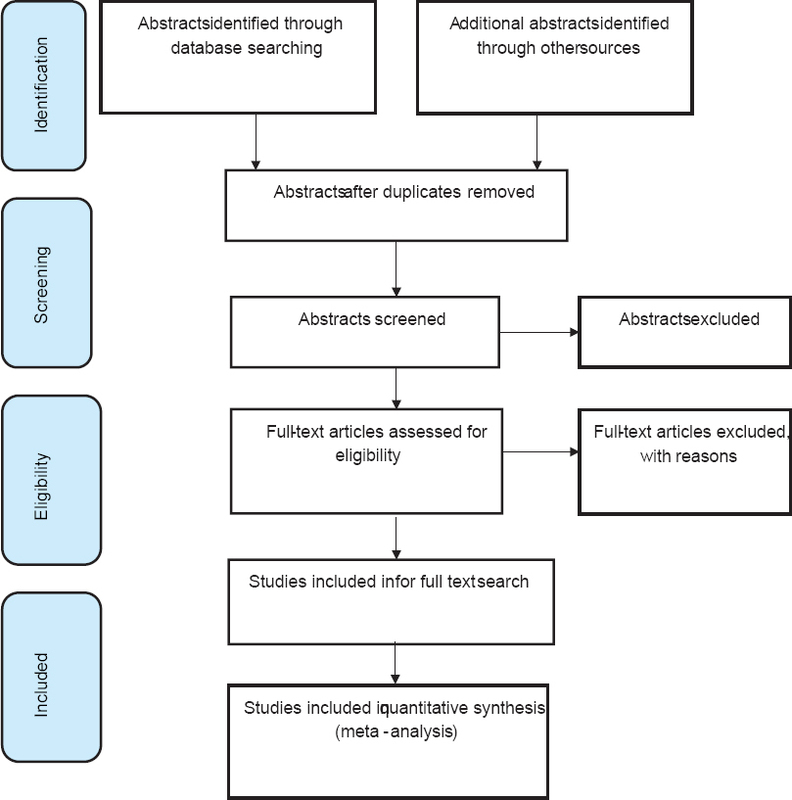 Methods: A systematic review will be undertaken aimed at synthesis of evidence of relative risk of mortality in type 2 diabetes, using the Centre for Reviews and Dissemination guidelines. We will explore conflicting and unanswered questions in relation to mortality. The primary outcome is all-cause, overall-cause or total mortality expressed as hazard ratios. Sub-groups will also be explored; age, gender, socio-economic factors and causes of death. We will review abstracts published after 1990 in the English language. Our data source will include electronic databases; the Cochrane library, the Centre for Reviews and Dissemination, Medline/PubMed, and other grey literature. The study populations are type 2 diabetes patients whose mortality outcome, expressed as hazard ratio, has been evaluated. Data extraction will be undertaken by one reviewer and triangulated by the second and third reviewer. The quality of the included studies will be evaluated in accordance with the inclusion/exclusion criteria; methodological quality that meets the critical appraisal framework and the relevance to the research questions. Evidence from data will be synthesised through a descriptive epidemiological review from included studies; meta-analysis will be used if appropriate. Result & Conclusion: We expect to pool homogenous studies of large population cohorts which explore the hazard ratio of mortality, and to summarise the evidence of the actual mortality risk in type 2 diabetes, with limited bias. This will help direct future research in areas of unanswered questions and may influence healthcare policy decisions. In recent decades our understanding of platelets' role in immune response has increased. Traditionally platelets were considered as bleeding-stopping and thrombosis-causing cells. In recent years the platelets' role in malarial innate and adaptive immune responses is being recognized. Platelets play critical role in pathogenesis of malaria infection leading to variety of outcomes. 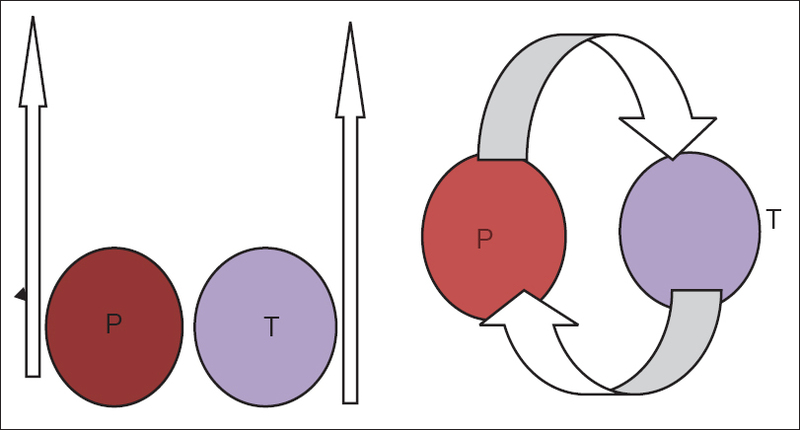 It is being realized that platelets play dual role in case of malaria (i) by preventing early stage exponential growth of parasitemia (ii) promoting exaggerated immune responses later. 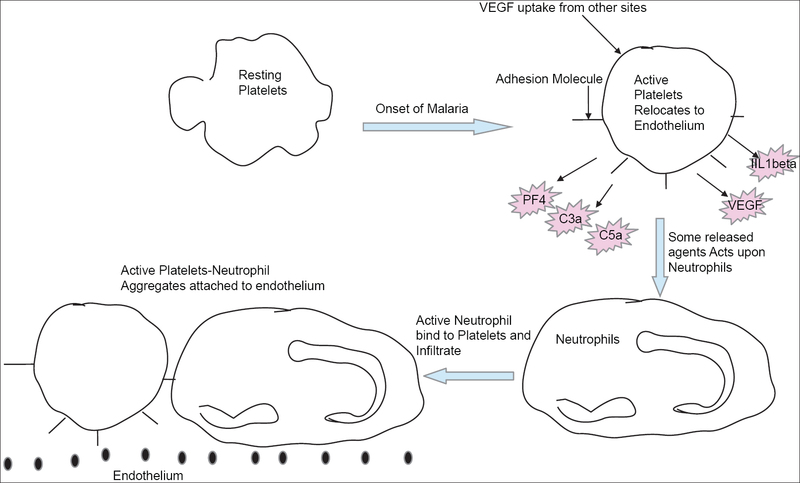 Platelets role in pathogenesis of severe and cerebral malaria has been widely studied. However their role in malaria related acute lung injury and respiratory distress has gained less attention. Recently the presence of active megakaryocytes and proplatelets have been explained in human lungs. Simultaneously, the platelets role in pathogenesis of acute lung injury and respiratory distress (ALI/ARDS) was also recognized. This gives a hint that there is a possible association of platelets with malaria related respiratory diseases as well. ALI/ARDS are characterized by lung edema due to increased permeability of the alveolar-capillary barrier and subsequent impairment of arterial oxygenation. In this review we have attempted to establish the importance of role of platelets in malaria related acute lungs injury and malaria acute respiratory distress syndrome and try to explain the underlying mechanism of this process. In ALI/ARDS, including those caused by malaria, platelets participate sequestration to the vascular bundle facilitating the recruitment of immune cells viz. neutrophils. Additionally, they secrete or induce the secretion of chemokines that result into vascular damage. 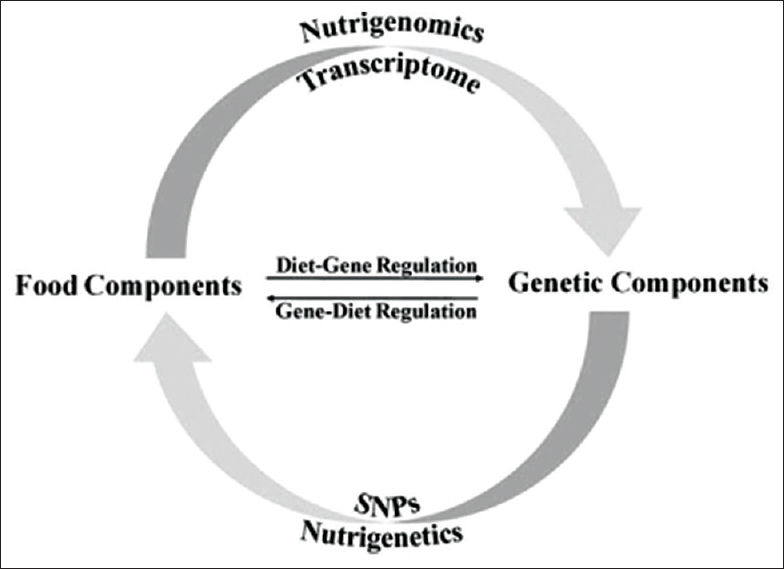 Nutrigenomics refers to the application of genomic principles in nutritional research, enables us to formulate associations between specific nutrients and genetic factors, e.g. the way in which food or food ingredients influence gene expression. It aims to identify the genes that influence the risk of diet-related diseases and also helpful to solve the mechanisms that underlie these genetic predispositions. In contrast, nutrigenetics reveals the coordination of genetic makeup of individuals with their responses to various dietary nutrients. It clarifies different responses to same nutrient by different individuals. Interaction of genetic background and diet with regard to development of chronic conditions as obesity, cardiovascular disease, hypertension and cancer are discussed in present review. These two branches of nutrition resemble with two sides of a coin, facing towards opposite sides but simultaneously, they are intimately attached with each other. Collective efforts by the scientific community are needed to strictly follow guidelines put forth regarding experimental designs, analysis, and data storage for nutritional research. This strategy will be helpful to generate a sound database useful for clinicians and dietetic practitioners. Counter transference (CT) is a common phenomenon, which is encountered by many therapists during therapy sessions. This paper discusses possible underlying intra-psychic conflicts present in therapist, which need to be dealt before commencing therapy of patients. As problematic relationships present in therapist life can influence or worsen course of therapy because of inadequate responses that therapist can exhibit due to counter transference (CT). CT can be dealt by enabling therapists to recognize this process and to maintain patients' priorities over their own needs. This can be emphasized in teaching or residency programs of training through therapy of a resident during training period. Constant and closed supervisions are required to note subtle behavioral processes going on in therapeutic alliance to prevent boundary violations, transference and issues like resistance. Diabetes mellitus is a metabolic disease which is caused by absolute or relative insulin deficiency, and the prevalence rate of Type2 diabetes mellitus (T2DM) is growing among Indians as well as through worldwide. Various risk factors play a role in the aetiopathogenesis and in the glycemic control among the type 2 diabetic patients. Therefore, identification of environmental and easily modified risk factors is urgently needed to prevent development of T2DM. One of various such risk factors, vitamin D3 level & therefore serum calcium levels are reported to alter the glycemic control. The major and most well-known function of vitamin D is to maintain calcium and phosphorus homeostasis and promote bone mineralization. However, recent evidence suggests that vitamin D and calcium homeostasis may also be important for a variety of non-skeletal diseases including T2DM. Based on basic and animal studies, vitamin D and calcium have also been suspected as modifiers of diabetes risk. The systemic review was carried out to evaluate the evidences as well as limitation in respect of vitamin D3 and serum calcium level regarding the glycemic control in T2DM. 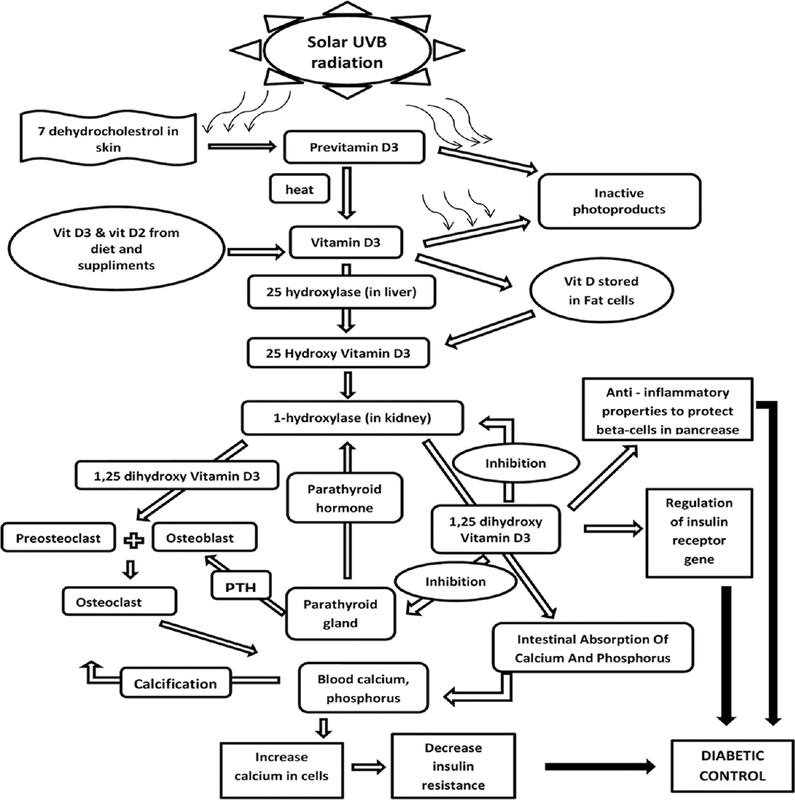 This paper seeks to examine the consistently reported relationship between glycemic control in T2DM and altered vitamin D3 & serum calcium concentrations, with reference to the possible underlying mechanisms. So the status of above two parameters is considered as an important factor in T2DM patients. Its role in present scenario should be understood both as an etiological concept & also as a therapeutic option. Zinc has been developed as an effective and nontoxic therapy in Wilson's disease. Zinc salts are generally well tolerated. Mild gastrointestinal discomfort is the major observed side effect and may be dependent on the zinc salt employed. 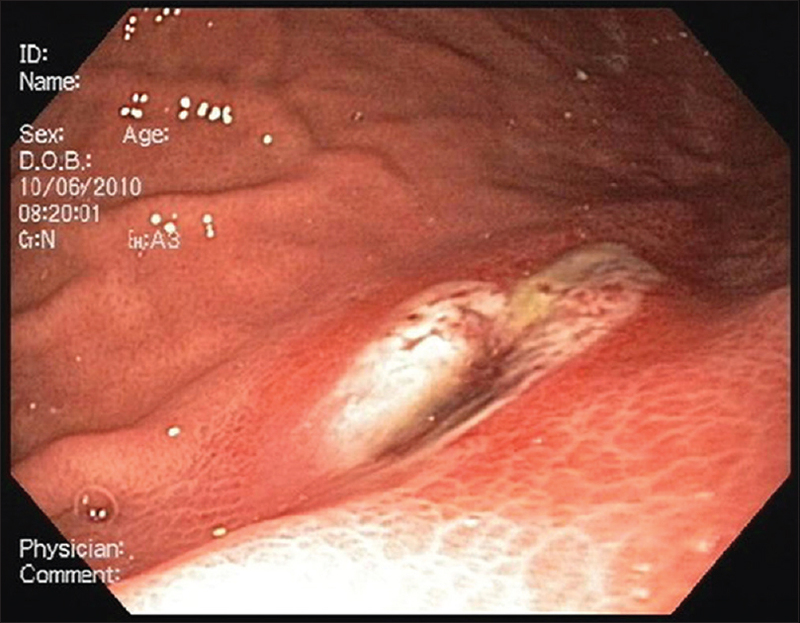 Here, we report two Wilson's disease patients who presented with severe gastric ulceration few months after beginning treatment with zinc acetate 50 mg three times a day. Our patients were not taking any ulcerogenic drugs and had no evidence of Helicobacter pylori infection. In both patients, zinc acetate was replaced by penicillamine and proton pump inhibitor therapy was initiated with complete resolution of gastrointestinal symptoms. To our knowledge, this is the first report of zinc acetate-induced gastric ulceration, which should be looked for in Wilson's disease patients who develop abdominal discomfort while on this drug. Introduction: Fluoxetine is a selective serotonin reuptake inhibitor (SSRI). It is licensed for the treatment of depression, obsessive-compulsive disorder and bulimia nervosa. It is thought to have a low adverse effect profile compared to conventional tricyclic antidepressants (TCA). It was first marketed in 1989, and since then fluoxetine has become the most widely prescribed antidepressant. Even though it was claimed earlier that fluoxetine has little or no effect on reducing seizure threshold, its association with seizure activity is being increasingly recognized. Results: We report a case of 53 year old depressed male with no apparent risk factors, treated with 20mg of fluoxetine for 3 weeks, experienced a seizure. Conclusion: Clinician should be aware that seizure and the cardiac dysrythmias have been reported in the literature, the risk of seizures depends on important critical factors like an individual's predisposing factors, followed by the amount and rate of dosage titration, and the relative epileptogenic potential of the particular drug.